The history of the Civil Rights Movement of the 1950s and 1960s is the story of individuals who, at great personal sacrifice, challenged the racial segregation practices in this country. Steppingstone Theatre’s production of Ruby! The Story of Ruby Bridges spotlights the quiet courage of one such individual: a six-year old girl who spent a year of her young life fighting segregation on a daily basis. Christina Ham’s play and Gary Rues’s music tells the story of this very brave girl. Steppingstone Theatre gave the world premiere of Ruby! The Story of Ruby Bridges in 2013. This review describes the company’s 2016 revival of this children’s musical. Listen to the real-life Ruby Bridges and area residents describe her first day at an integrated school. Read more about the real-life Ruby Bridges. 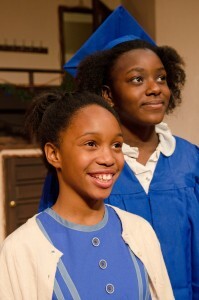 Rylee Armstrong and Danyelle Robinson as Ruby Bridges. During the push to end segregation in schools, young Ruby Bridges was chosen to go to first grade as the first black student at a white elementary school. Ruby and her mother had to start her first day of school going through angry white picket lines with adults and children alike yelling insults and threats to Ruby. When Ruby finally entered the school building, she found herself in a class of one since the few white students who ventured to go to school were not put in a class with her. Ruby had to face the daily pickets every day while she spent a very solidary year with her teacher who was the only friend she had at school. Anya Kremenetsky directs a talented cast in this well-paced play that combines dialogue, children’s games, music, and emotion to share this story. Rylee Armstrong (the six-year old Ruby) and Danyelle Robinson (the older Ruby looking back on her first year of school) play off nicely with each other and in their singing duets together. Charla Marie Bailey portrays Ruby’s mother with a firm and quiet strength supporting her daughter’s quest for integration. Misty Koop as Ruby’s teacher, Mrs. Henry, provides a friendly white voice to a little girl who must repeatedly force her way through angry white protesters. Kremenetsky’s direction blends emotion, civil rights songs, and spirituals well to tell this story of self-sacrifice and persistence. What is most impressive is the way this show manages to tell this story of both hate and hope on a level understandable to young children without dwelling on the ugliness of racial hatred. Ruby! The Story of Ruby Bridges runs through February 28 at Steppingstone Theatre in St. Paul.